An exclusive symposium organized by India Law Offices (ILO) & Confederation of Indian Industry (CII) in the Capital on Wednesday witnessed over 100 small and medium enterprises (SMEs) from 20 countries exploring strategic partnerships with Indian companies. It was an interesting mix of developed as well as developing nations, discussing and exploring tie-ups with their Indian counterparts. The delegation saw participation from varied industry sectors viz., Solar & Hydro Energy, Dairy, Construction Equipment, Agriculture & Processed Food, Aviation, Textile, Automotive, IT & Infrastructure, etc. keen on Joint ventures and investment in the country. "An economy grows only when its Small & Mid Market segment grows. 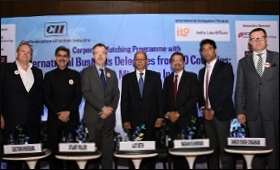 With this initiative to fuel the Mid Market growth in India, we have organized today's symposium which has participation from more than 20 countries like Germany, Canada, Italy, Greece, Austria, New Zealand, Cyprus, China, Lithuania & Kazakhstan, etc," said Gautam Khurana, Managing Partner, India Law Offices (ILO). Having offices all over India and partner Law Firms in over 30 countries, ILO is among India's leading Corporate Advisory Law Firm. Present on the occasion was Atul Chaturvedi, Additional Secretary, DIPP, Ministry of Commerce & Industry who apprised the gathering on FDI Policy of India & its Future Trends & Expectations. Ajit Seth, Ex Cabinet Secretary of the Republic of India addressed the gathering and shared how India has progressed over the years and how the country is striving to become one of the best economies in the years to come. "India has emerged as one of the most attractive destination not only for investment but also for doing business in the recent years. One of the fastest growing economies in the world which has not only sustained global downturn of 2008-09, India is slated to grow at consistently higher rates during next few decades," added Madhav B Shriram, Chairman – CII Delhi State, and Deputy Managing Director, DCM Shriram Industries Limited. The Symposium was attended by over 120 Indian companies across the country.